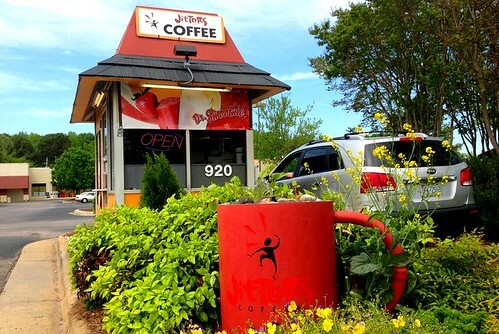 Jitters Coffee ~ Local Coffee On The Go In Cary! Update: Jitters is now closed. The owners have opened up a coffee shop at a new location called Racin Java in Fuquay Varina. Visit their facebook page here. 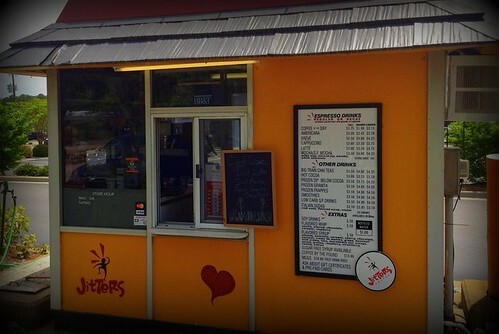 I love to explore locally owned coffee shops in the Triangle and recently my coffee adventures took me to a unique little drive thru coffee shop in Cary called Jitters Coffee. Jitters is located in the entrance to the Food Lion shopping center parking lot off Kildaire Farm road just outside of downtown Cary. There are two things that make this little coffee shop so unique. The first is that it is a drive-thru coffee business that operates out of what I would describe as a coffee “hut”. You pull up to Jitters in your car and a friendly barista takes your order, creates your drink and hands it to you through a window. 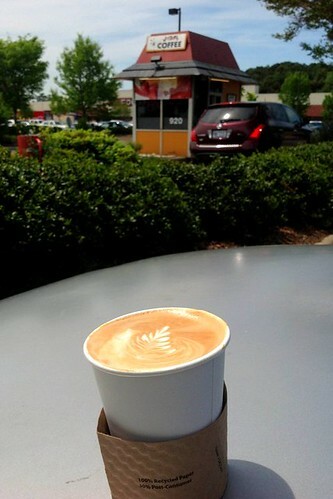 The second thing is Jitters is the only place in Cary that serves locally roasted Carrboro Coffee. Don’t let the small size of Jitters fool you. 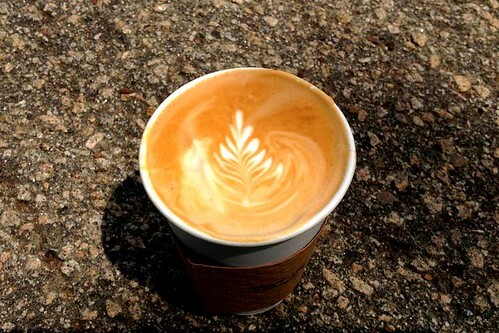 They offer a full selection of coffee and espresso drinks that rivals the menu of any larger coffee shop. They even have fruit smoothies and a host of flavored shots to add to your favorite hot or cold beverage and offer various seasonal specialty drinks throughout the year. Their menu even features a frozen espresso drink called a “Granita” which is similar to a frappe but has a lot less calories. I had a sample of their Granita on my first visit and it was delicious. Of course my two favorite coffee drinks are lattes and cortados, and on this occasion I had a perfectly crafted latte (pictured above) and it even had some cool latte art action going on. Jitters has been serving the faithful coffee crowd in Cary for several years now but is under new Management as of October 2012. That’s when local residents Jennifer Vaaler and Brett Coleman took over the business. Since taking the reigns, Jennifer & Brett have brought new inspiration to Jitters by offering locally roasted Carrboro Coffee, which is one of my favorite coffee roasters – their espresso is amazing! They have also been updating the landscaping around the coffee hut by planting a cool little garden out front surrounding the larger than life coffee mug fountain. They even added some cool tropical banana plants along the backside of the hut making Jitters feel and look like a little coffee oasis. Jitters ~ A Coffee Oasis! When it comes to great coffee spots, it is the little things the count. For example, while I was at Jitters taking pictures I saw several regulars pull up, Jenn & Brett knew them by name and began making them their “usual” drinks without even having to be asked. A neat little finishing touch on each hot drink is an easy to remove lady bug sticker on the “to go” cup lid to keep the steam in and the coffee warm. I highly recommend local coffee fans check out Jitters if you are looking for a new place to grab your coffee on the go or just want to try something new. I think you will be glad you did! Cute store! I love the little drive-throughs in the Washington area. Seems like they often don’t make it here, so I wish these guys the best of luck!